After my Gluten Free Tortilla recipe went viral on Pinterest, I got many requests for a nut-free and gum free version. After several attempts, I came up with a delicious Paleo/Gluten Free/Nut-Free and yes, xanthan gum free version. Phew! Is that a mouthful! Of course, I had to make this recipe kid friendly for all you kiddos out there with serious nut allergies! I want to make sure you enjoy this recipe! Be sure to help your Mommy make it! My first few batches came out looking like flying saucers so not to worry if they aren’t a perfect circle! Just keep practicing! 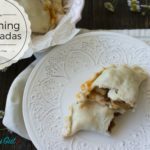 This recipe is perfect for burritos, fish tacos, and quesadillas for all you cheese lovers! It is pretty easy to make. First you will whisk together cassava flour and salt. Then, stir together the hot water, honey and oil. 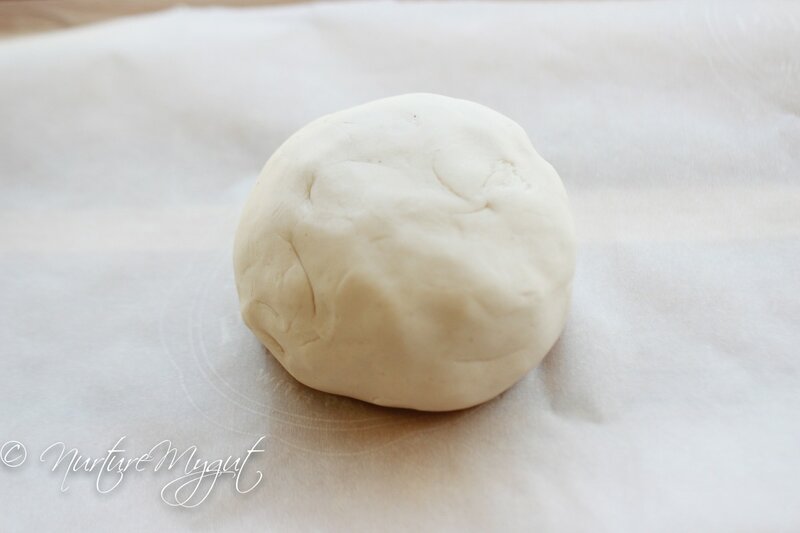 Next, mix both together and you will have formed a soft dough. If you have a stand mixer, it will do all the work for you. Nevertheless, this will work perfect by hand too. Just make sure the dough has cooled enough before handling it. 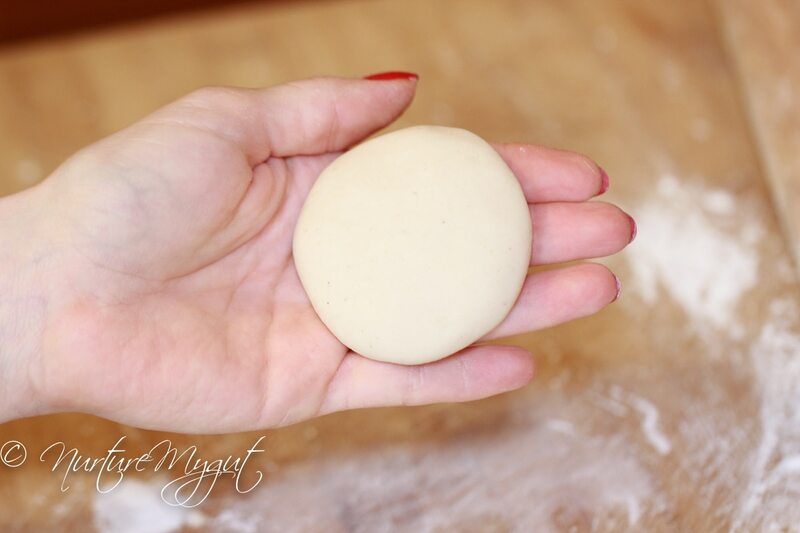 You will have a large ball of soft dough as the photo above. 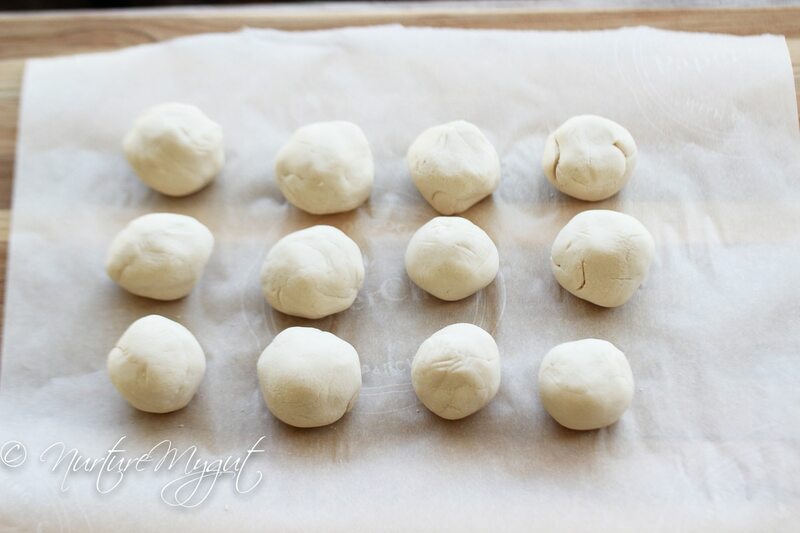 Next, divide the dough into 12 even balls and place in a ziplock bag. 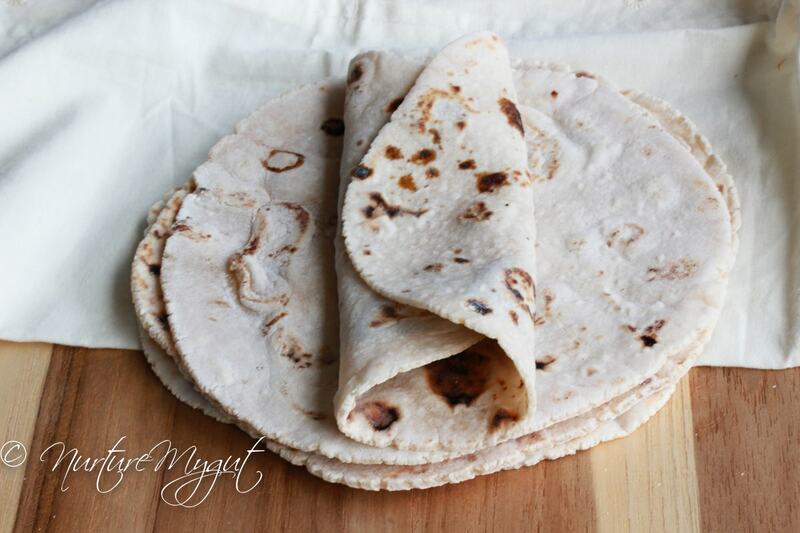 This will prevent the dough from drying out while you are rolling each tortilla. 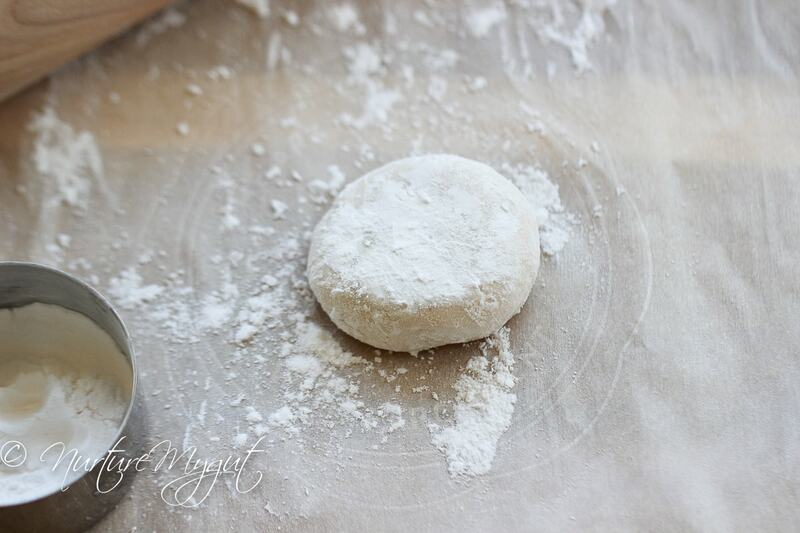 Roll your dough into a disk. See the photo above. Then, dust it generously with tapioca or cassava flour. I tried both versions and the tapioca flour works best. It has a finer texture. 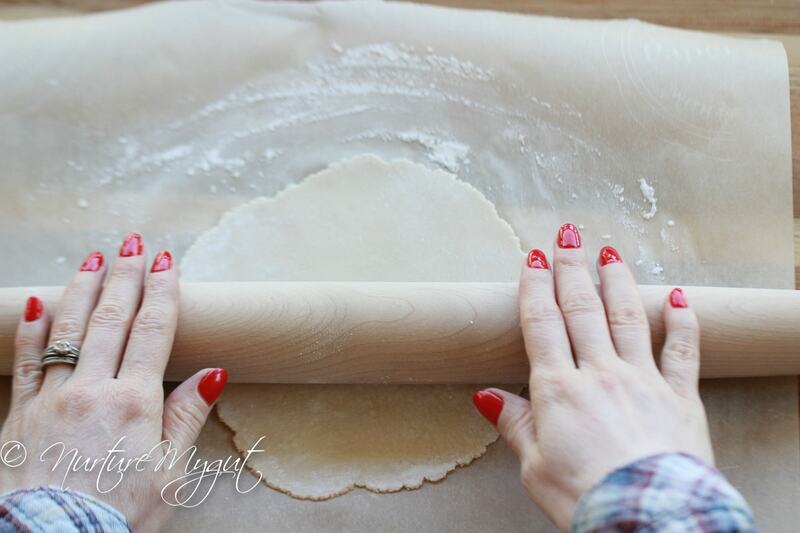 Then, use a wooden rolling pin to roll out your dough to a 6 inch disk. 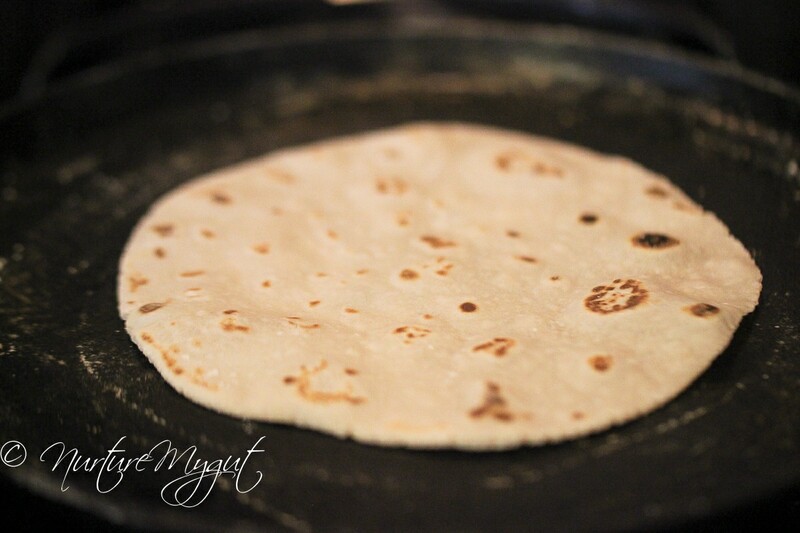 Be sure to flip and dust your tortilla with tapioca flour throughout so it does not stick to your surface. When your cast iron griddle is hot, place your tortilla onto it. Flip once bubbles have formed. Your tortilla will start to puff up nicely. Once both sides have brown spots as in the photo above, place it in a tortilla warmer (or towel wrapped in aluminum) foil to steam. I got my tortilla warmer on Amazon and I love it! It keeps my tortillas warm and soft for about 45 minutes! 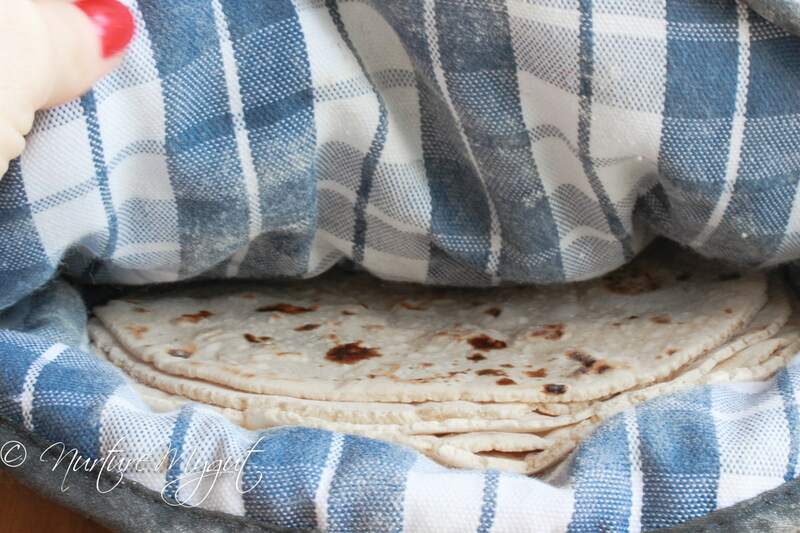 After your tortilla has steamed for a few minutes, it will be soft and flexible. These are simply delicious. Be sure to keep them warm before serving. 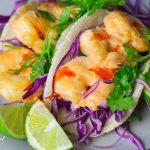 Two of my favorite recipes for tortillas are Thai Shrimp Curry and Fish Tacos. Hi there! 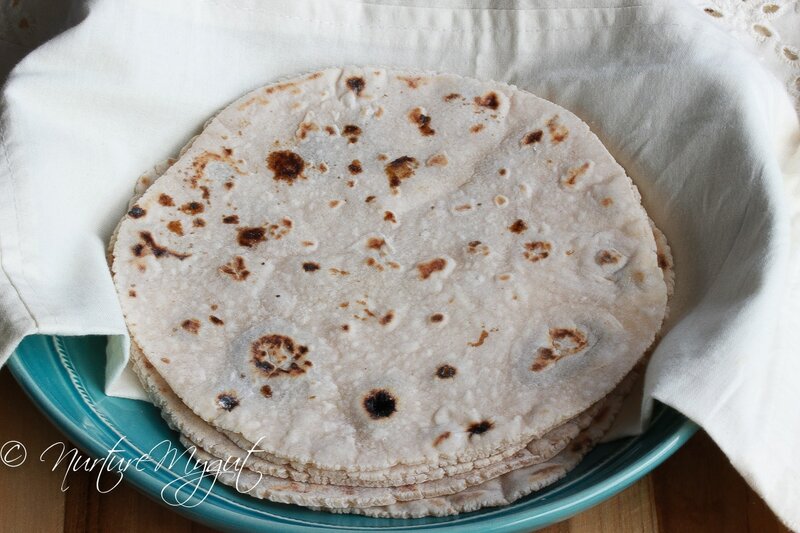 I tried looking through the comments first so I apologize if I missed it – I’m trying to find a replacement for my husband’s beloved wheat flour, burrito-sized tortillas for his lunch wraps. I have celiac disease and it’s one of the only things he keeps around that isn’t gluten free because he’s amazing (he keeps them in a seperate drawer with his cute little gluten-filled toaster). I want to make him something healthier, with good fats and something maybe I could enjoy as well. Anyways, do you think would these work for a cold lunch wrap? Would I need to heat them first to wrap? Do you think they would hold together being stored cold and rolled up in a lunchbox for a few hours? Figured I’d ask before I made them. Thanks in advance! Yes, this recipe will work in a cold wrap. 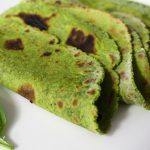 I have made the spinach version of these tortillas for a turkey wrap for my kids and they loved them! 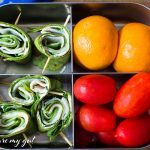 My daughter recommended your recipe….and I am SO glad she did! They came out perfect! At first I had a little trouble with weird shapes and irregular crumbling edges (I’ve never rolled out a pie crust so getting these into something that resembled an actually round tortilla was a little frustrating to say the after the first few attempts, I was really wishing I had a tortilla press – but I keep procrastinating on buying one. One though I am kinda good at is improvising …so I cut out another piece of parchment and one of my dinner plates and Voila I had made my press! It pressed it down into a thin perfect circle and I only had to use the rolling pin just a bit more to increase the circumstance of the tortilla. I’m pretty excited to say the least! Due to my autoimmune disease I must stay away from gluten, but as a Central Valley Cali girl, going without tortillas is nearly impossible. So my deepest thanks for sharing this recipe as I can now return to my tacos and not try to hide the. 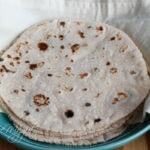 cardboard taste and texture of store bought “gluten-free tortillas with extra salsa! So I’m not sure if I did something wrong…followed instructions as you have listed I believe. The dough was very crumb-like and hard to form the dough balls. Had to add more water to it. 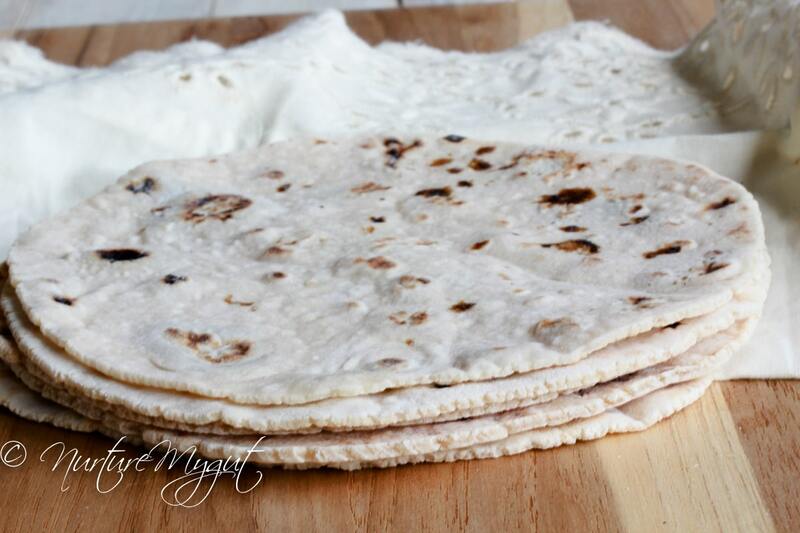 They formed jagged edge tortillas. Do you cook with oil on the pan or just hot pan? Mine came out the same way. They looked like snow flakes. Followed the directions exactly. These were very good. An excellent recipe, thanks for sharing. I miss read the instructions and added the water, oil, and honey separately and they still turned out great using my Kitchen Aid. I tried your pizza crust recipe tonight. I was planning on bookmarking it for a later day, but when my son heard me say, “oh a pizza crust recipe that doesn’t have 5 different flours in it.” Well, he heard ‘pizza’ and asked for pizza for dinner. An of course once he started, his four year-old sister chimed in. The problem was that I didn’t have potato starch and we don’t really eat potatoes so I was planning on researching to see if I could sub an alternative. Well, I decided to just go for it and substitute tapioca flour for the potato starch. The dough was a little wet but after it rested I split it in two and rolled the dough out between two pieces of parchment paper and then pre-baked them on my hot pizza stones. They turned out great. A good crunch on the outside but still tender inside with that lovely yeasty dough flavor. They even held up to our mega wet veggie pizza with mushrooms, peppers, onions, spinach, olives, and fresh basil. Everyone was happy eating the pizzas. The dough was not an okay substitute, but a legit tasty dough in its own right. I will totally be making these again. Next time I will triple the batch and bake off the crusts and then freeze the extras for later use. How do I know how many carbs, etc are in them? Is it possible to make these without the honey or any sweeteners? If so how much replacement liquid would I use & what type? Has anyone ever made them in a tortilla press ? Hi Ester does it have to be cassava flour? Would coconut or tapioca work just as well? Just made these tonight with a 1/3 of the recipe to make four 6″ tortillas for dinner to serve with an AIP pulled pork recipe. I rolled them out thin and as best a round I could and then used a 6″ pot lid to cut a perfect circle! 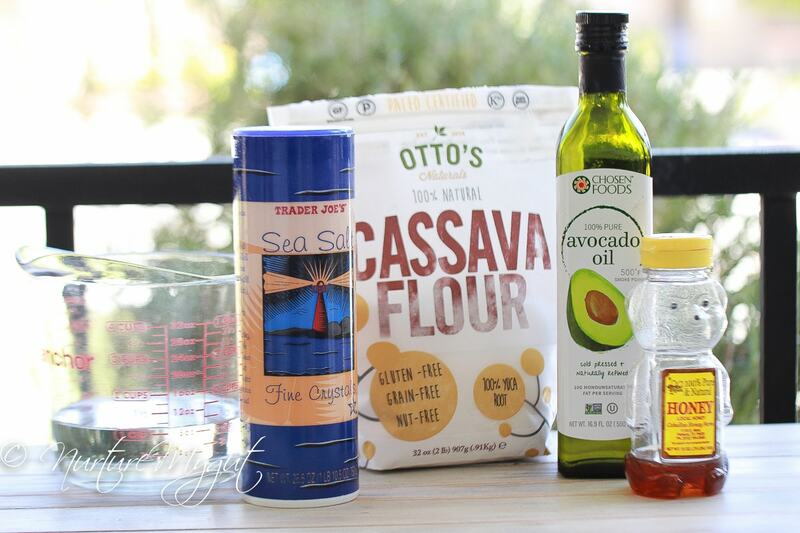 First time using cassava flour on my AIP diet and they were a welcome treat! 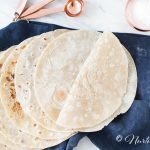 Never made homemade tortillas before but these were easy. Thanks so much for the recipe! Can’t wait to try these! Have you tried cooking them ahead of time and storing them? Do you know how long they might keep after cooked if stored in the refrigerator? Thanks for the great recipe!